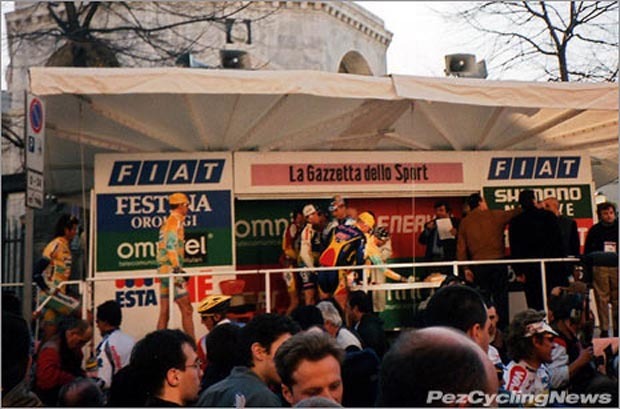 The Spring Classic from Milan to Sanremo has a long history over its 106 editions, it has beauty and romance and 'The Pez' made the trip to take in 'La Primavera' back in 1998 and then revisited in 2010. Here is the Pez back at his Milan adventure. Berta, Cipressa, Poggio... three girls I dated in high school? I wish. Considering the form, the curves, and the mystique that each of these capi add to the season’s first and longest Classic – well, let’s just say I should have been so lucky as to ride... I mean date... these hills, I mean girls. 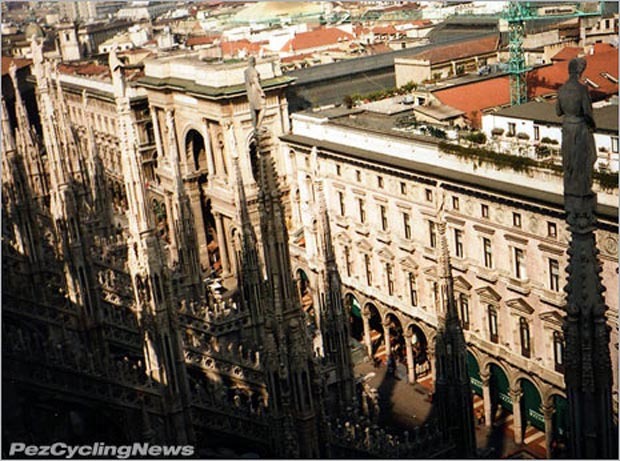 I visited my first Milan-San Remo in 1998, then waited 12 years to return and see it full on in 2010. There’s no place I’d rather be than in Italy for 'La Primavera', and I’ve spent considerable time pondering why this race is so special. To understand something – almost anything – in Italian culture, is by no means a simple or straightforward affair. This could be why the classic coffee house was practically invented there – to provide a forum, sustenance (and commerce) for Italians to indulge their greatest pass time… discussion. It’s also why most discussions in Italy never really have an end point, but instead have simply a pause or ‘to be continued’ point, under different circumstances, among different people in a different place. Understanding what makes the Milan-San Remo bike race so special, and so important to Italian culture – and cycling culture – is no simple task either. It’s a fair bet that the race is older now than anyone on the planet who’s followed it from the start. And without a direct link to its true roots, we’re left with our own ever evolving interpretation of what makes this one bike race “La Classissima”. 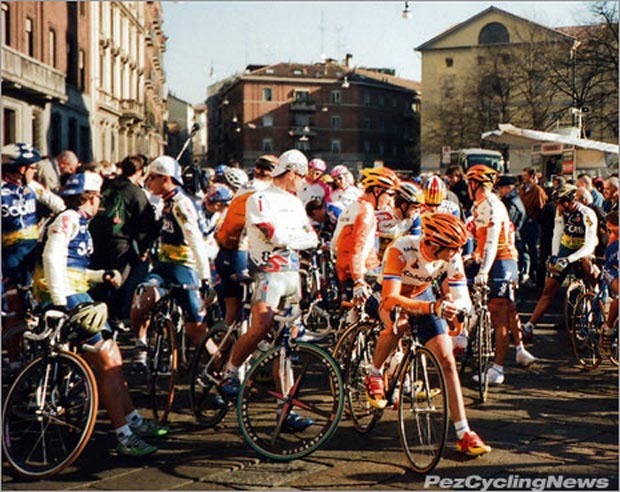 My own relationship with ‘La Primavera’ began properly in 1998 when I was in Milan for the start. And although I’ve followed the race in recent years with increasing interest and pleasure, my ‘reunion’ visit in 2010 marked my first time to witness the spectacle from the palm-lined strade of San Remo herself. It also marked a chance to connect with this beauty in a much more personal way. Sign on – this must be the right place. I admired her from afar for far too long. A long time ago I decided that one list I had to complete was a personal visit to the big races – the Grand Tours of course, and as I became more of a fan and grew to know more about cycling sport, I added the Classics, Monuments, and a bunch of other great races too. Pascal Richard looked almost regal with his Olympic rings. 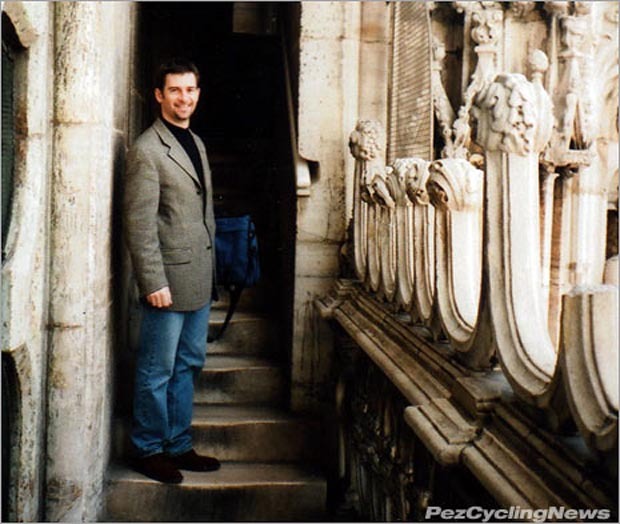 Since I started PEZ in 2002, I’ve likely seen more big races than the average North American fan, but perhaps less than you might expect given my access to the sport, and legit reasons to head off to Europe to see ‘em. Of course getting to Europe from Vancouver is no simple weekend getaway, and with a growing family and the other husbandly/fatherly duties to attend to, my Euro-jaunts have been more limited than my fantasies would like. But after years of eyeing the Italian Riviera as a place to spend a few days in March, my dreams become reality shortly after the birth of my second daughter in 2009. Mrs. Pez loves jewelry the same way I love riding my bike around the hallowed roads of Europe, and graciously greenlighted my trip to Sanremo shortly after the presentation of a lovely ring to commemorate the occasion (...of our daughter’s birth). It’s that kind of mutual support that makes a marriage work… but that’s another story. Never one of my favorites, even Virenque inspired some awe. 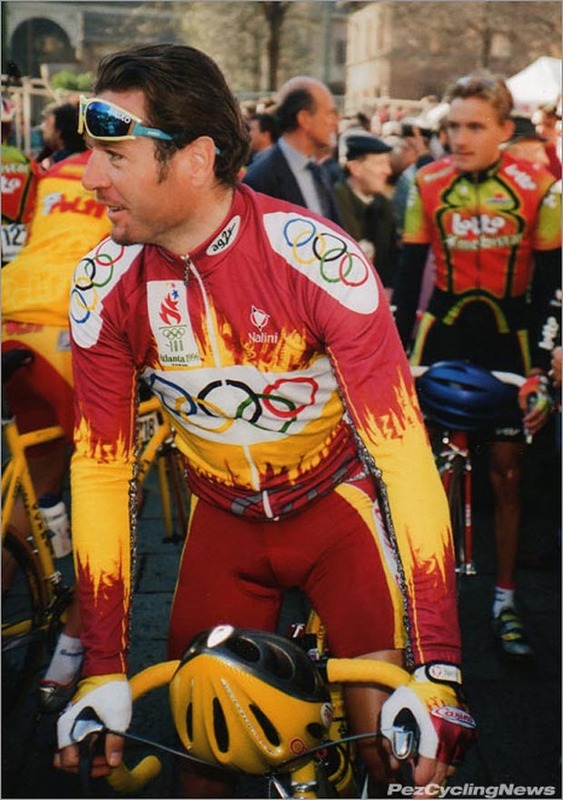 From my first trip to Le Tour in 2003, I learned that it’s impossible to fully understand and appreciate these races without seeing them for yourself. Reading about them can give you all the stats, the whodunit, and even amazing photos of the day, but even our own attempts to bring readers along for the roadside ride don’t fully convey the real emotion, and experience, of chasing the race for yourself. I’ve reported from ten Giros, but still feel like I’ve only scratched the surface on what that race is really all about. My first trip to Roubaix and Flanders was a watershed in terms of my own appreciation for the Classics. The region of northern France defines ‘bleak’, yet the unequaled beauty of those races swells up when you first set eyes on the gray and cold landscape. 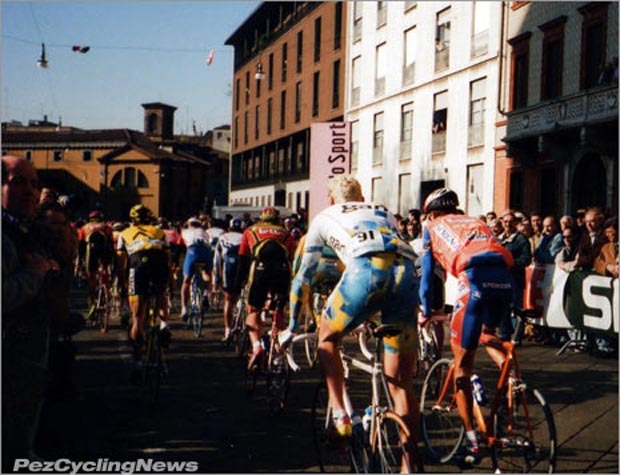 At my first Sanremo in 1998, I was admittedly a newb to the big races – I’d seen stages of a couple Tours and Giros, which just wasn’t enough to know or appreciate the significance of even the longest one-day Classic on the calendar. ...the views across the Milanese rooftops are well worth the few euros admission. I was living in Bergamo at the time, and arose early to get to the start by 9:00AM for rider sign-in. 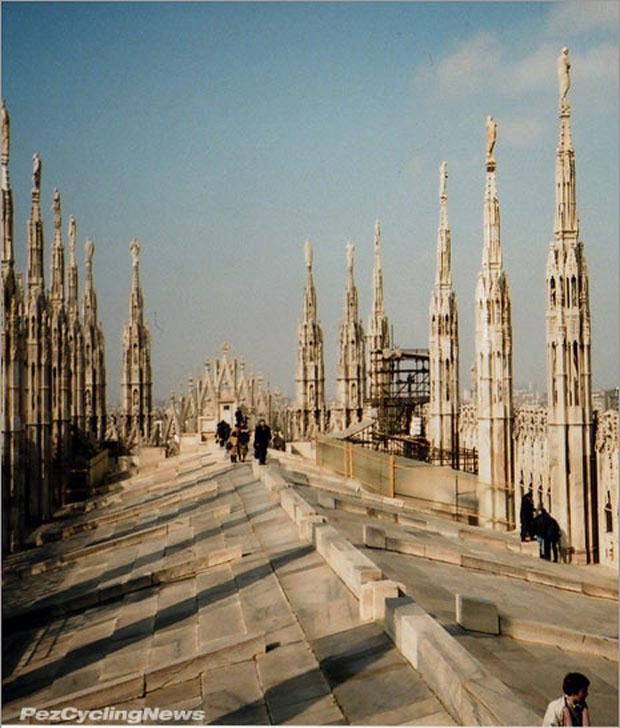 My race intel was bad, and arriving at Milano’s Duomo, I saw none of the usual ‘hubbub di partenza’. But a few minutes and a couple stops down the green line, I walked up onto the street in the right place. The day was clear and sunny – but a lot cooler than I expected (note to self for next trip.) Somehow I’d managed my way inside the barriers, and jammed straight into the throng of fans, riders and journos at the sign in. Like any Italian crowd, there was the typical pushing and shoving, so I ducked and dived like a Pez sock in the wash cycle. 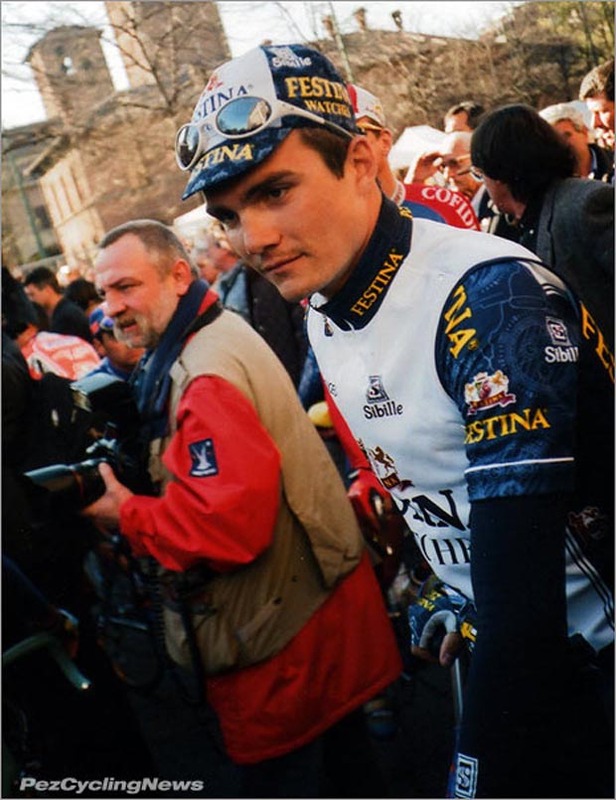 In a second the crowds parted and the riders began arriving – Pascal Richard, Rolf Sorenson, Richard Virenque, Marco Pantani and more. Visual proof that I was there. 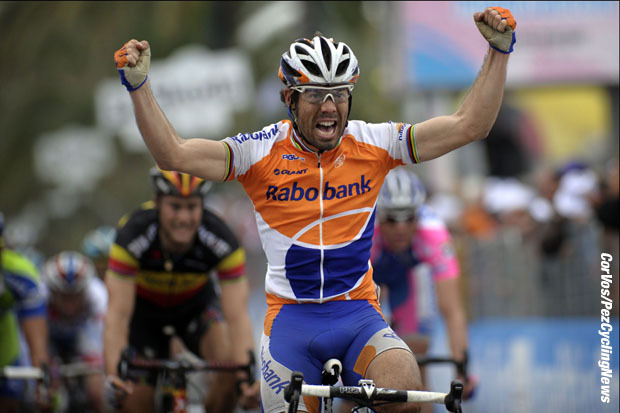 I was stunned to be standing right in the mix of cycling’s biggest stars. My girlfriend at the time, whom I’d dragged along, finally seemed to be enjoying herself as she commented on how good looking all these guys were. The whole thing passed like a quick spin cycle, and then they were off – rolling out for 300km and a very long day in the saddle. I spent the next few hours trolling around Milan until I found a bar around 3PM to watch the finale unfold. Like any classic beauty, something tells me trying to understand Sanremo will be a lot harder than simply enjoying her for who she is. It was a cool experience – but I was unfulfilled and longed for more. For my return visit in 2010 I was much more prepared, and excited by what lay ahead. Instead of a few hours, I’d taken a few days devoted just to this race. I reached the coast on Friday for my own personal introductory rides of those ‘tre capi’- Berta, Cipressa, and Poggio. I didn’t know who would get the final rose, but just like The Bachelor, I was keen for some one-on-one time with each of the ladies. A bleach-blonde Magnus Backstedt brings up the rear as the bunch rolls out. And that’s Graham Watson in the shadows at picture left. I knew that one visit, or even a few days, wouldn’t allow me the kind of insider know-it-all of a resident Italian, born a raised on the Ligurian coast (like someone our own Ale Federico possesses) but I was thrilled to get on the ride and see how far it would go, and who I’d meet. 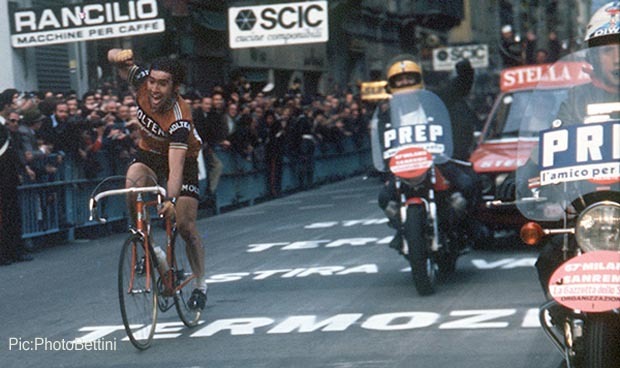 The finish line in Sanremo saw Oscar Freire as the 2010 winner and on two other occasions, but Eddy Merckx raised his arms in victory seven times on the most famous of finish straights: The Via Roma.